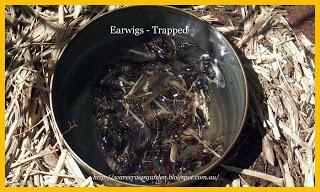 Springtime means Earwigs in the garden. 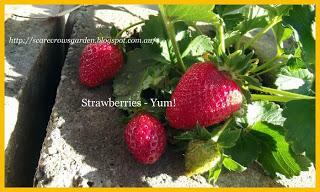 Just when you are trying to plant out tender young seedlings...they disappear over night if not protected. Trapping the earwigs in tins of water with oil is one way of reducing their numbers when you don't have time to be checking hose traps everyday! I think the numbers above tell the story...frost one day then hot the next...usual for this time of the year. Most of the Beans were direct sown but a back up of 6-8 of each were sown in the greenhouse...just as well since most of the climbers have been eaten by earwigs as they emerge! 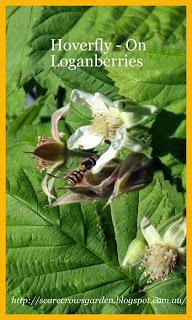 When Bed 6 was cleared it was full of earwigs...so the Faverolles came out and cleaned it up! 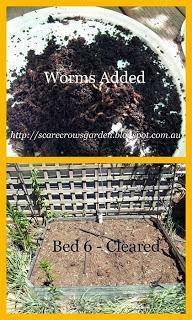 Then I needed to top up the bed with more compost worms since they didn't just eat the earwigs! 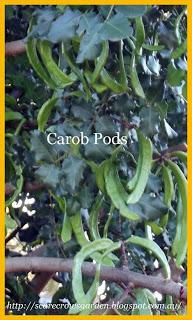 When started to cut back the Carob tree we found it was covered with pods this year.